It is essential to complete these unfinished W.P.A. 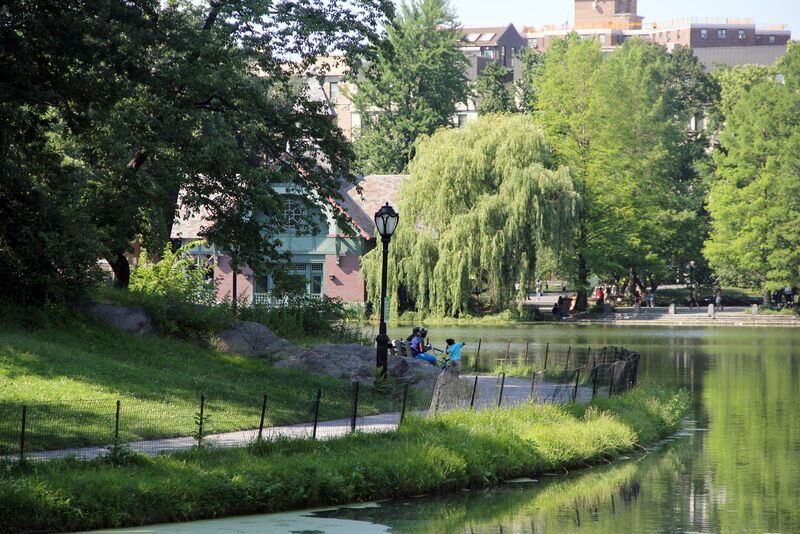 projects as quickly as possible to protect the work already done and the public using the parks in and adjacent to these uncompleted areas ... HARLEM MEER, CENTRAL PARK, the largest improvement consists of the reconstruction of the northeastern corner of Central Park extending from Conservatory Gardens to 110th Street and from Fifth Avenue to East Park Drive. The new development which is about 50% completed retains with slight modification the original shape of the lake, presently drained for construction operations. A new fifteen foot promenade is being built around the shore line completely encircling the lake. Frequent connections will be made to a secondary path system which will parallel the shore promenade and connect with the main park entrances from Fifth Avenue, 110th Street, Conservatory Gardens and the general park path system. The south slopes and ravines will be interlaced with foot paths and trails winding through interesting plantings leading to tree shaded overlook benches from which the lake and Conservatory Gardens may be viewed. Benches will also be conveniently spaced along the lake promenade and the general path system including the trails. A combination brick boathouse, comfort station and refreshment concession with, a 360 foot boat landing platform are the main features of the north shore adjacent to 110th Street. Two new entrances will be opened in the north wall of the park with stone stairways leading to the boathouse plaza. Convenient approaches to the two existing marginal playgrounds, north and east of the lake, will be provided. At the end of the war the 360-foot boat landing platform will be completed, and the combination brick boathouse, comfort station, and refreshment concession will be constructed on the north shore of the Meer near the Fifth Avenue entrance. This work was omitted from the present contract because the material needed is considered critical by the W.P.A. The boathouse opened 1947, so it can't be a WPA project. Or can it? How was it paid for? By Federal money that had been allocated in 1943, but could not be spent? Was it designed by WPA architects in 1943? In any case, the intention was clearly for the WPA to build it in 1943 as part of all the other work it was doing at the Harlem Meer. As Moses said in his March 13, 1943, press release, "To leave [these projects] in their present condition until after the war would be a serious waste of funds already expended." The quaint-looking building in the image is not the 1940s boathouse; it is an entirely new building (called the Charles A. Dana Discovery Center) that opened in 1993; the 1940s boathouse was demolished to make way for it. New York City Parks Department Press Release of September 22, 1941. New York City Parks Department Press Release of March 13, 1943. New York City Parks Department Press Release of December 8, 1943. "Central Park Area to Be Improved For Benefit of Harlem Residents"; New York Times, Sept. 22, 1941. Central Park's Harlem Meer Boathouse, Daytonian in Manhattan website, December 17, 2010 (accessed 7 May 2018).